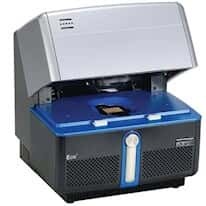 Thermal cyclers, also known as PCR machine or DNA amplifiers, can run numerous PCR samples simultaneously. Low-throughput thermocyclers can run between 20 and 48 wells. They can be less costly and require less bench space. Medium through-put thermal cyclers are the most common, allowing between 48 and 96 wells. High-throughput has 384 wells are required in some circumstances. Some thermal cyclers incorporate a gradient function, allowing different temperatures to be applied in various parts of the block. If the goal is uniform temperature across the entire thermal cycler block, a standard thermal cycler with no thermal gradient is adequate.